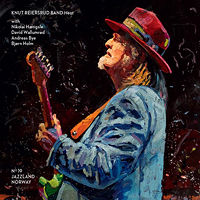 On "Heat", his second outing with Jazzland Recordings, Knut Reiersrud, Scandinavia's premier blues guitarist, is not only at the height of his powers, but is wilfully unleashing everything from his enviably substantial musical box of tricks. Progressive blues rubs shoulders with prog rock moments, train-track 6/8 rhythms jostle alongside atmospheric textures and evocative meditations; one moment there are exuberant Hammond chops and the next there are plaintive Fender Rhodes chordal chimes. Eastern influences inform beautiful slide guitar lines; melody and compositional excellence are pervasive, and – as anyone familiar with Reiersrud or the members of his band will expect – the solos are exquisite. Even the appearance of Bach's Cantata BWV 147 ("Herz und Mund und Tat und Leben") doesn't seem amiss. 12-bar blues structures are expanded upon or abandoned completely here, with "This was meant to be a sad song" demonstrating this most clearly, perhaps, with its literally faltering progress through its baroque shades of blue. Vocally, Reiersrud channels Curtis Mayfield to Muddy Waters to John Lennon to Cat Stevens, with perfect restraint and clarity, yet remains readily identifiable sonically as much as his trademark red hat and bristly goatee do visually. Lyrical preoccupations with the environment, and nature in general, shoot through the album like veins or roots, particularly on "Sacred Mama", "Wood" and "The Heat". While much of the album clearly has its roots in 60s blues rock, this is a peculiarly 21st century take on familiar chord patterns and tricks, whether evoking the spirit of Billy Roberts' "Hey Joe", or stirring the atmospheres of "In A Silent Way" into a funky and baroque country blues-rock gumbo. The album's concerns and preoccupations have greater urgency at this point in time, and the feeling that this is music for the end of history is keen. "Heat" was released on Jazzland Recordings in January 2018.